I love eating healthy fish recipes, and there’s question that salmon is a huge nutritional powerhouse, yet I’m not in love with the taste of salmon. So when I eat it, I need a fabulous sauce to balance the taste of the fish. This Broiled Salmon in Wine Dijon Sauce fits the bill perfectly. It has just the right amount of butter that adds the silky base to the sauce but yet is still low in Weight Watchers Points. The tang of the wine and Dijon work perfectly with the butter to create a most delicious sauce, which is truly an excellent complement to the fish. Make sure to serve the salmon over rice or with some roasted veggies to sop of all that delectable sauce! This makes for a wonderful Weight Watchers salmon recipe that is incredibly quick and easy to prepare. These perfectly flavored salmon fillets are topped with an elegant wine Dijon sauce that complements the fish perfectly, while still keeping a low Points total. This tasty recipe offers another delicious way to enjoy the healthy benefits of salmon. Preheat broiler. Line a baking sheet with foil and spray with non-fat cooking spray. Season salmon fillets with salt and pepper and place on baking sheet. 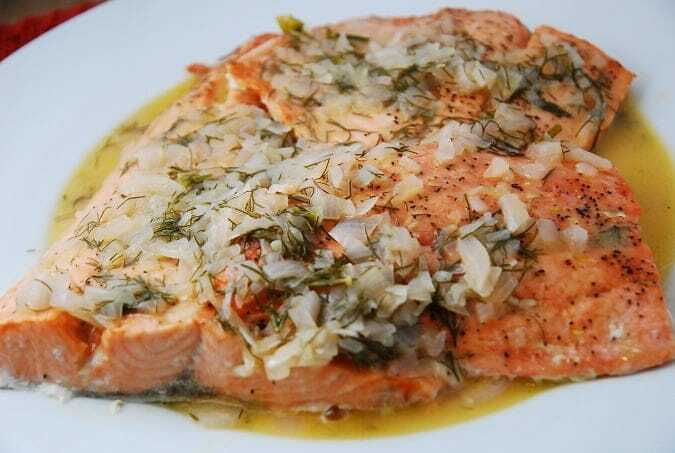 Place in oven and cook until salmon is cooked through and begins to flake, about 8-10 minutes. Melt butter small saucepan over medium high heat. Add in the shallots and cook until soft, about 1-2 minutes. Then add in the wine and cook until reduced by half, about 3 minutes. Set heat to low and whisk in remaining ingredients. Cook until heated through. Spoon sauce over salmon and serve. This’ll be our dinner tomorrow, thanks!